The sea is the truest coach. 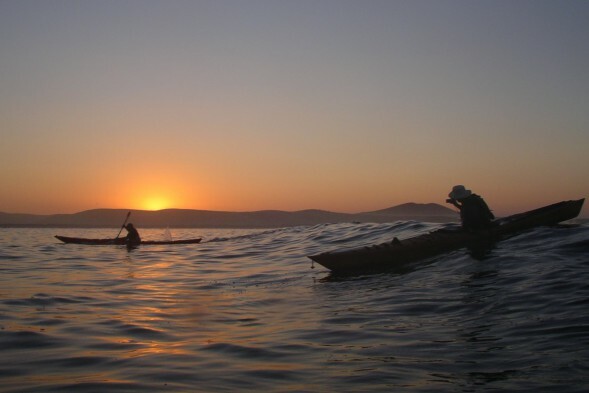 This remote and soulful Pacific coast location is where I learned to paddle on the sea. 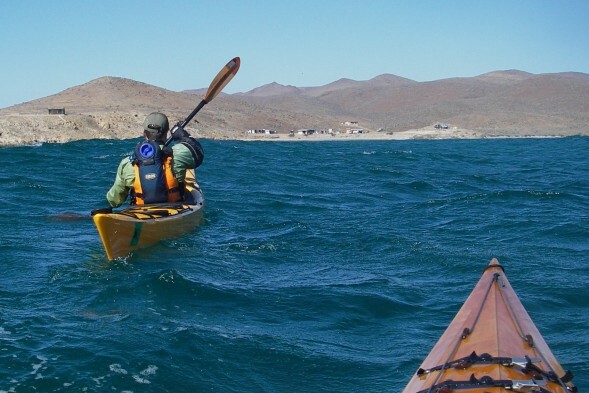 Sharing this special place is the dream that started Sea Kayak Baja Mexico in the first place. Come see why! Wake up beside the beach, float just off the point as the sun warms the day and the swells move through. Catch gentle rides, point breaks that peel to the right and let you out before they break, if you ask nicely. Study the waves and the other riders while catching a bite to eat in the palapa. Wander the hills on a windy afternoon and let the wide open spaces inspire and fill the soul. 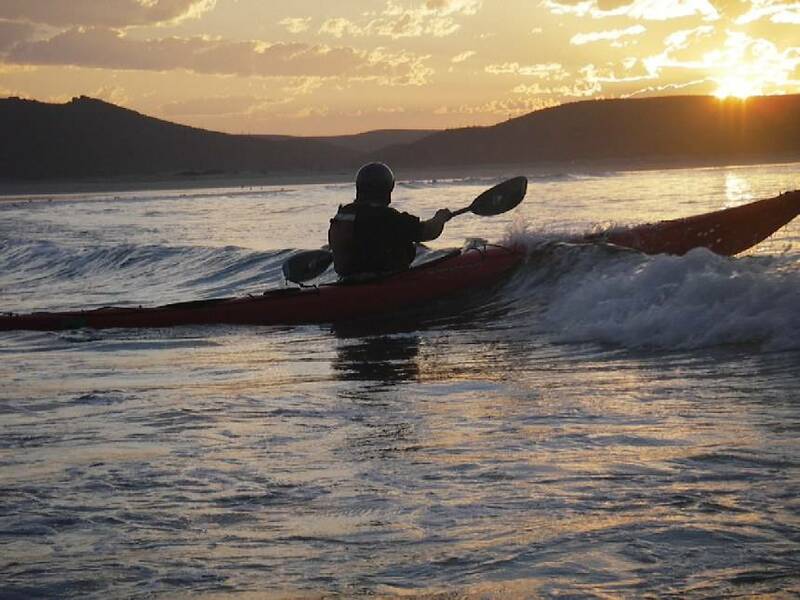 If you’re ready for something different, paddle up the coast to flirt with rocks. 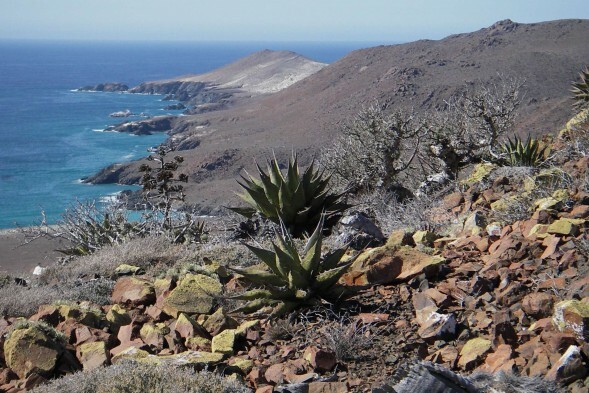 Blowholes, slots, and tiny sandy beaches provide scenery and challenges. Sometimes a gray whale glides on her long slow journey north. Camp itself is a collection of rustic palapas (3-sided buildings) on a remote Pacific beach in front of a point break. The bay actually faces south but is protected by the distant Vizcaino Peninsula, so only NW swell can make it into the bay. Swells are well groomed by the shape of the land and form peeling usually gentle waves. It’s popular with longboard surfers during the winter season. We’re shooting for the small gap between the surfers and the spring wind, just after Easter. We’ll base camp here and choose the adventure of the day based on the weather and on how we feel. 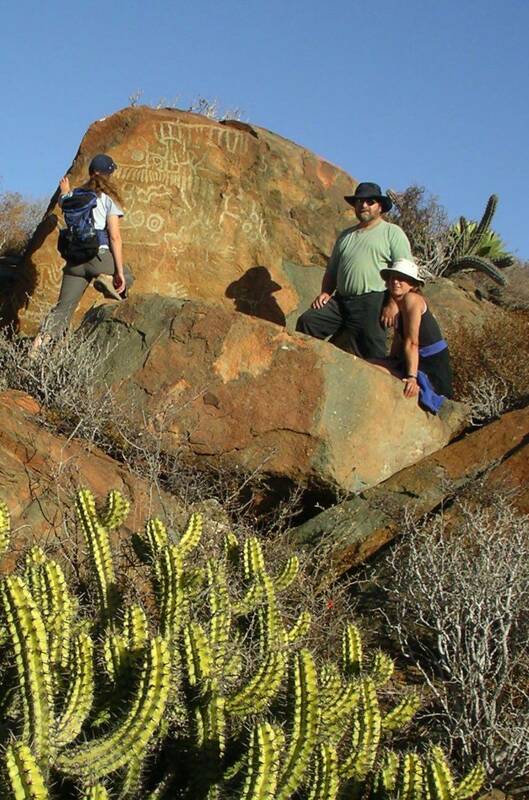 There are also hiking opportunities: to petroglyphs, to caves with shell middens, and along the wild shoreline. Dinners are catered in camp by a local family and feature seafood freshly caught by their relatives, with some store-bought variations. For this course, we are providing van transportation from San Diego. Mentally prepare yourself the rough 10-hour ride over semi-paved roads. It’s Baja! Remember though, many people actually survive this drive. Annually! And towing kayak trailers! You’re transitioning into a different time dimension. The scenery is like none you’ll see anywhere else. The Catavina boulder fields. The Valle de los Cirios National Protected Area with its unique, endemic plants which look like Dr Seuss designed them. 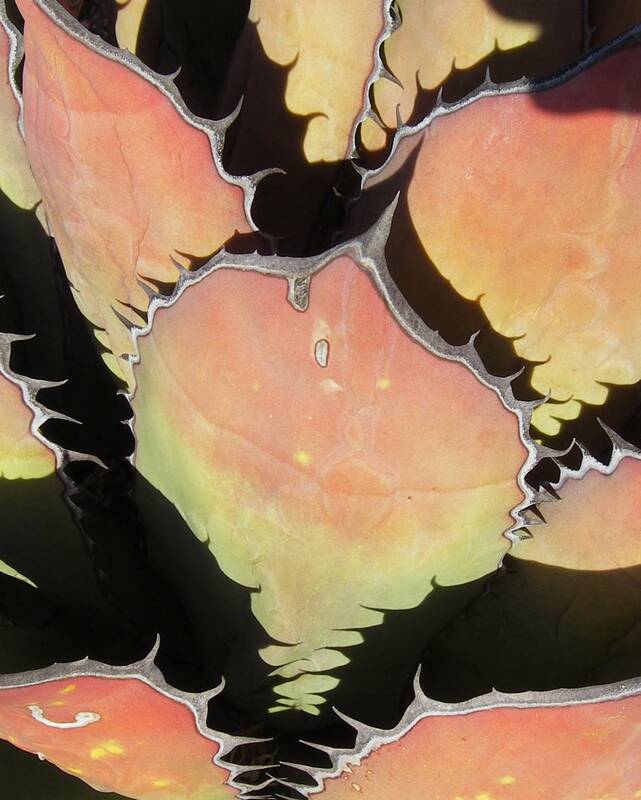 The Cardon cacti with their reaching arms petitioning the blue sky. Who can come? 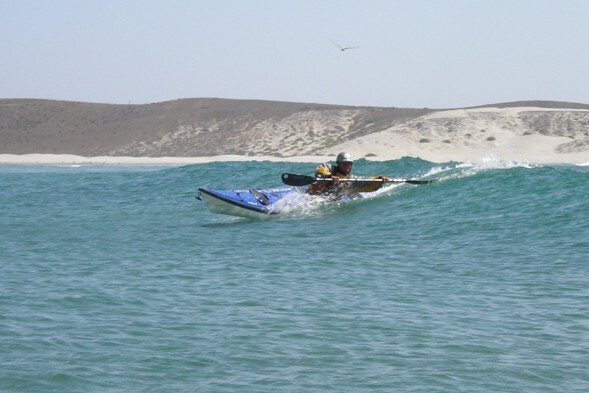 Because the surf is somewhat gentled by having to wrap almost 180 degrees to get into this bay, and the landing is mostly sandy, and because we’re base-camping, we can handle a variety of skill levels. You don’t need a roll, though it will be helpful. If you know what a brace is, can paddle in 15 knot wind with waves of 2-3′, and are interested in pushing your learning curve, you’re welcome to join us. In the British Canoeing framework, if you’re working on your Sea Kayak Award (3-star) and like to be challenged, that’s fine. 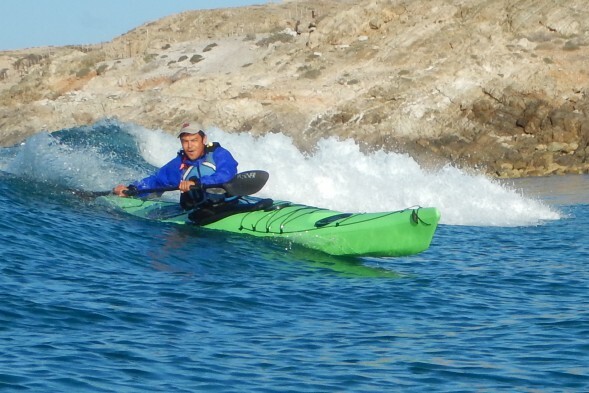 If you’ve got your Coastal Sea Kayak Award or 4-star or more, and want to play on an amazing coastline, you will be inspired. 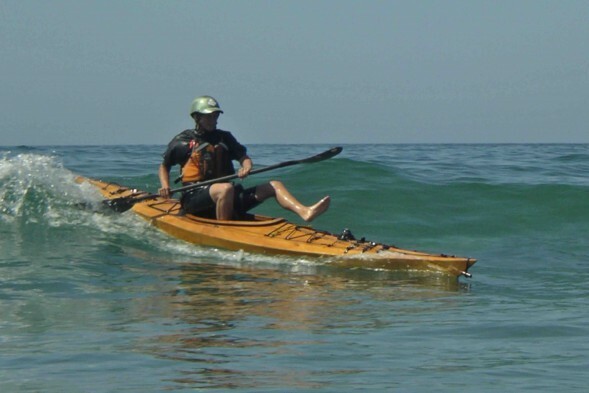 We’ll be providing sea kayaks–plastic Nigel Dennis Romany kayaks, or other fiberglass (mostly) NDK model. If you are interested in driving down with your other toys, please do. Surf kayaks, SUP, surfboards, and boogie boards are all fun to play with. We may have a SUP or two as well if we can fit it. On the April 14-20, 2020 Surf Camp, Bonnie Perry will drive the van down from San Diego and be our second coach. In British Canoeing, Bonnie is the fourth woman in North America to be awarded the 5 Star Leader on the Sea. She’s also a Level 3 Sea Coach, a 3 star assessor, and 3 star open boater. 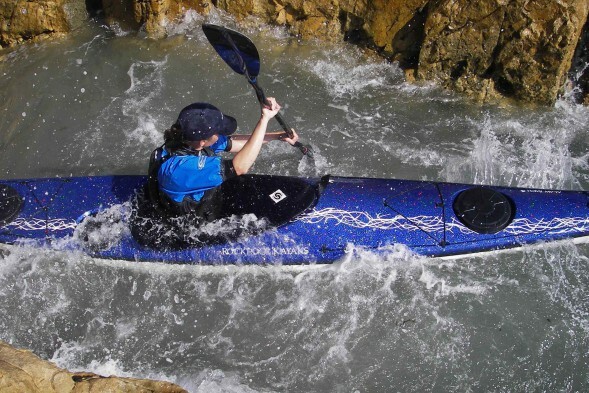 In the UKCC she is one of three people in the US with the Level 3 Discipline Specific Sea Kayak Training. In the ACA, Bonnie is a Level 4 Open Water Instructor Trainer and in Paddle Canada she’s a Level 2 Instructor. Bonnie spent her formative years in Hawaii messing around on surfboards. Surf Camp will be a homecoming for her as well, coaching others in the magnificent forces of nature, and inviting them to express joy through play. When Bonnie is not on the water she is the Rector/Senior Pastor of All Saints’ Episcopal Church www.allsaintschicago.org. On the April 22-28, 2020 Surf Camp, the inspirational and energetic Eder Arreola will drive the van down from San Diego and be our second coach.